It is handy to have an arsenal to scrape contours and details. This is mostly clean-up work done after routing or planing. 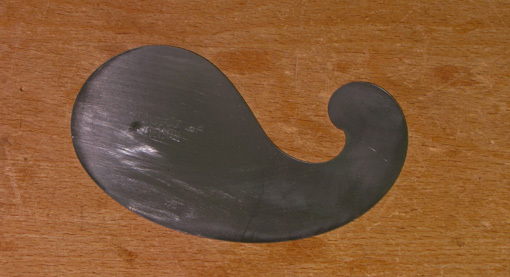 The “gooseneck” scraper, above, handles a lot of concave contours. This Eberle model is about 0.028 inches thick. I do not know the Rc hardness but it seems softer than the Rc 48-52 of my other scrapers. Lee Valley has nice choices. Cleaning up a cove, on a raised panel, for example, can be done by setting this scraper into the cove and then angling it to make the edge match the contour. To understand this, hold a coin in front of you and observe how the visible curve at the bottom changes as you turn the coin on the vertical axis. Angling the scraper also facilitates a smooth cut, though too great an angle will cause the edge to slice the wood and create tracks. By the way, does that scraper look like a goose neck to you? To me it looks more like a whale or maybe a goose body without its legs and head. The two little guys below are handy for all sorts of clean ups such as scraping glue out of a corner. They are 1″ x 2″, 0.020″ thick, Rc 48-52, and available from Lee Valley. Because their small size makes them hard to bend, you might want to file a slight camber in one or two of the edges to avoid gouging by the corners when doing work on an open surface. 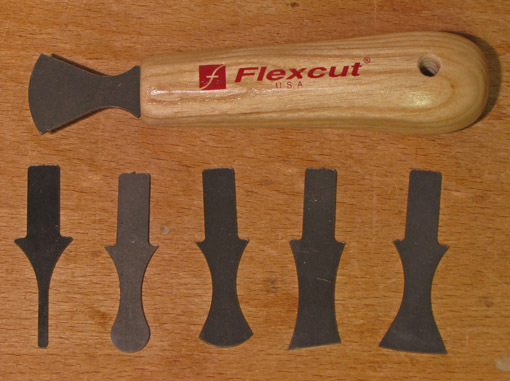 The set of Flexcut scrapers, below, are earning their place in the shop. The scrapers are inserted into the handle and secured without screws or hassle. At 0.050″ thick, they are quite stiff. 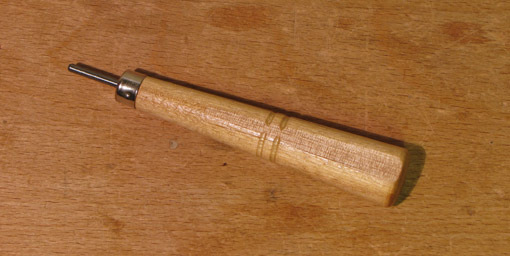 The handle can be held in various ways – like a pencil, in a fist-grip, or a fist-grip with the thumb behind the scraper. Both the ends and the long side edges are useful. I don’t use this tool frequently but its versatility sure is handy when the need arises. Lynx makes a set of contour-edged scrapers that looks like a good option, but I have not tried them. Here are the Flexcuts tucked away in the little holder I made for them. Sharpening these small and curved scrapers can be awkward. The small scrapers do not necessarily need a burr but I find they work better with it. The short carbide burnisher, available from Lee Valley, is convenient for preparing these scrapers. Once again, my purpose here is to present a range of options and discuss what has worked for me, with the hope that this will help you sort out what is useful in your shop where you are the supreme commander, king, lord, and unquestioned deity, unless of course, your spouse or pet happens by. The outward simplicity of the hand scraper belies the many options available for this wonderful tool. 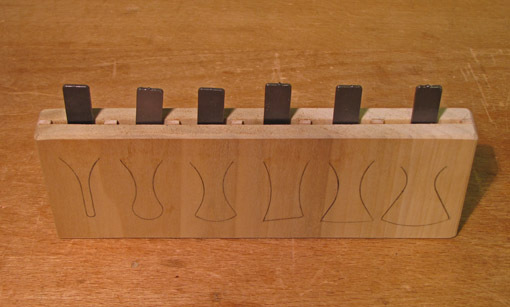 For a card scraper, several parameters influence its utility. These are: thickness, width, steel hardness, and, to a lesser degree, height. In this post, I will discuss the card scrapers that I find useful in my shop. The 0.032-inch thick (usually listed as 0.80mm) scraper is the one most commonly referred to in discussion, instructional materials, and in catalogs, but is the one I use least. This is a thick scraper suited, in my view, primarily for heavy use on bare wood or for removing finishes. I have Bahco and Lee Valley versions, both Rc 48-52, 6″ wide, and 2 3/8 – 2 1/2″ high. One of them is filed to a slightly concave edge along its length for use in creating subtle convexity on the surfaces of legs. For general use, this relatively stiff scraper does not afford the sensitivity of the thinner models. For my work, hand scraping is usually done near the end of the surfacing sequence when a delicate touch is desirable. The 0.024-inch thick (0.60mm) scrapers are the most used in my shop. They are from Lee Valley. I like the 6″ width which makes it easy to camber sensitively for long work sessions. The same thickness available from Bahco is only 5″ wide which reduces some of that sensitivity, and just seems too narrow for my hands. I wish Lee Valley would make them taller than 2″. 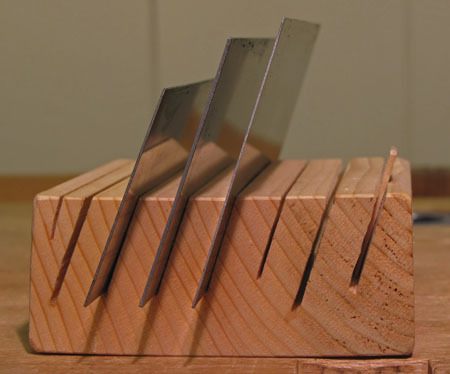 I own two and always sharpen them at the same time, giving eight edges ready to work. They are Rc 48-52 as are all of Lee Valley’s card scrapers. By the way, Lee Valley’s scrapers come with the edges ready for burnishing. For especially delicate work, including touch-ups and error correction, Lie-Nielsen’s 0.020-inch thick (0.50mm), 6-inch wide, 2 1/2-inches high, Rc 49-51, is just right. It bends easily, allowing light shavings in a small area. This flexibility, however, makes it hard to avoid unevenness in larger areas of work. Lie-Nielsen also makes a 0.032″ model. I also keep an 0.020-inch thick Bracht scraper as stock to cut and shape for special applications. Thin and soft at Rc 38-42, it is easy to cut and modify for dedicated use in a project. 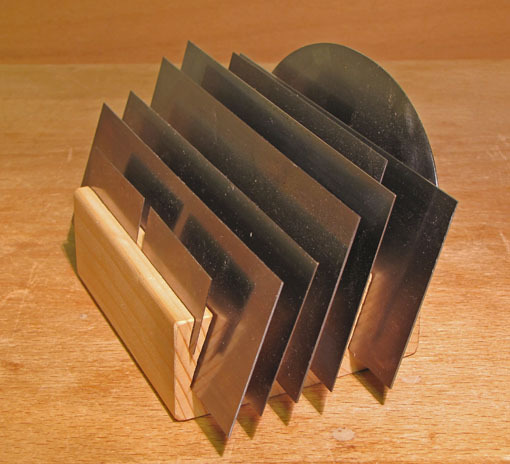 In the photo below, from left to right, are 0.024″, 0.032″, and 0.020″ scrapers. The holder is a hunk of 2×4 with some slots bandsawn at an angle. In summary, my go-to scraper is 0.024″ thick, but the other options are still very useful. Most important, I want to call attention to the available options and encourage readers to try them and find what works best for them. These are just my preferences. Scrapers are inexpensive tools so I suggest get a bunch. Having one scraper is like owning one pair of socks. Next: more sizes and shapes. It is not easy to make fine things from wood. 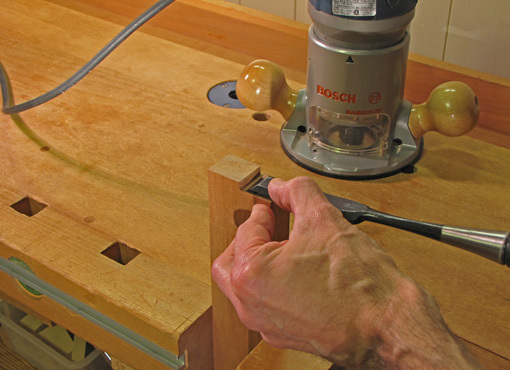 Woodworking is a succession of mostly subtractive steps which requires careful planning. 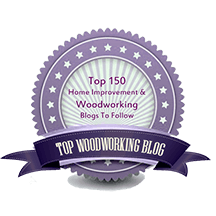 The critical differences between success and failure in most woodworking processes are subtle, often difficult to reliably articulate, and regrettably seem to require a bit of failure prior to the success. Human nature creates a tendency to imagine an easy path to success, and, further, to seek this illusory path against all odds. Now certainly, woodworking can be taught and learned with reasonable diligence and, along the way, plenty of fun. Today, there is an abundance of excellent learning tools which admirably remove the unnecessary mystery from woodworking. Unfortunately, the woodworking student – and that means all of us – can be easily distracted by the allure of magic. Magic is everywhere in the world of woodworking. Catalogs tout machine jigs, especially for the router, that guarantee “perfect” results “every time”, hinting that no real skill is required. Sharpening and finishing, perhaps because they harbor perceived mysteries, are particularly prone to the din of hype. Gurus demonstrate astonishingly fast technique making parts that are conveniently abstracted from the constraints of a real project. Sure, there are places for time-savers, innovative devices, and instructive demonstrations. The point here is that the hype can lure you to squander your efforts seeking answers in the wrong places while neglecting the acquisition of true craftsmanship. Though the noble task is slower than we might like, and sometimes disappointing, it is ultimately joyful. Consider this: the only magic tools are the ones attached to the ends of your arms, and they only do what your brain tells them to do. 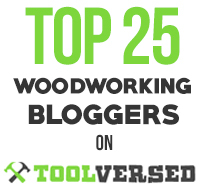 I suggest being cautious about where you invest your time and energy in developing your woodworking craftsmanship. You very likely have an intuitive sense of true skill and quality, especially if you have developed it in other fields. Follow that, not the hype. That’s the way to happy woodworking.